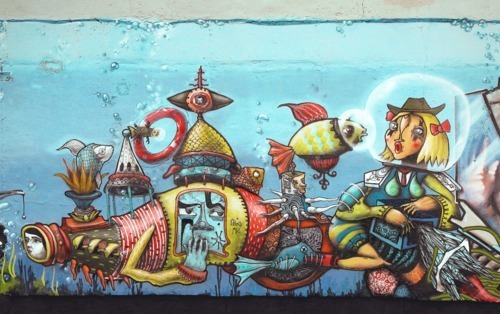 Vitae Viazi are a street art crew from Moscow. Their work is inspired by Slavic culture, calligraphy and ornaments and they aim to create the world of fairytale stories on the walls. 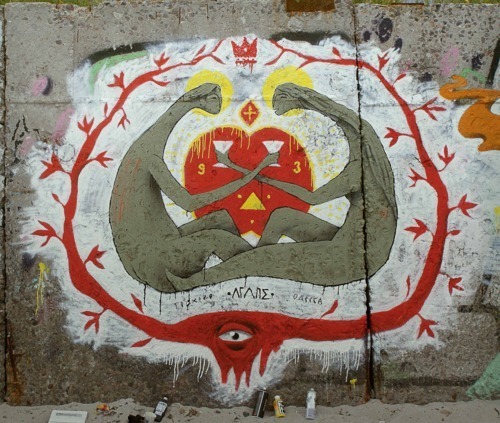 They are the first Russian street art crew I’ve interviewed so it’s a pleasure to connect with a new country. The name “Vitae Viazi” comes from the latin “vitae” (“of life”) and “viazi,” which is the name of a special ornamental Cyrillic script. There are 5 members in the crew: Stasik Kanevsky, Senya Juchkov, Masha Very-Mary-Land, Lesha Atomsky and Den Zenin. Kanevsky, Mary and Juchkov started painting together in 2009; Atomsky and Den joined in 2011. We started painting walls together in Moscow in 2009. It was hard to make the walls because they were illegal and the paintings had a lot of detail. It’s difficult to get a legal wall in Moscow because of the authorities and their conservatism. Very often the struggle leads nowhere. That said, the attitude of authorities differs from city to city. Ekaterinburg in Russia holds a yearly street art festival “Stenograffia” for example, with big walls that are provided to artists by the city. We believe that one day (and with our help) the mind-set of Moscow authorities will also change and Moscow-based artists will get more opportunities to make murals. Whenever we paint the local citizens show their approval with their smiles and words, so hopefully Moscow will change soon! Last year we painted in Odessa, Ukraine and were pleasantly surprised that there was such a warm welcome for our art from local people. If we have a chance to go there this year we definitely will! Since the beginning we tried to use the basis of our Slavic culture in the creation of our works. We have great art and unique cultural traditions that are not well remembered nowadays, unfortunately. For quite a long time, under the heavy influence of Western culture when we discovered it in 1980’s, traditional Slavic culture was neglected by the young generation. It was hidden from the people outside post-Soviet countries and from many people inside these countries as well. We try to dig deep into the details of forgotten Slavic beauty by searching for the examples of old fonts and looking at the techniques that were sued to create ornaments. With this knowledge we can incorporate many amazing elements into our artworks and make them live again on the walls. Today we are at the very beginning of painting season in Russia and we plan to make this season the best that we ever had. There are plenty of walls waiting for us and many new people to share our art with!